Just take a look at some of the big movers in the under-$10 complex from Thursday, including American Apparel (APP , which soared higher by 21%; Everyware Global (EVRY , which ripped to the upside by 17%; Telik (TELK , which jumped higher by 9.7%; and Samson Oil & Gas (SSN , which trended up 9.4%. You don't even have to catch the entire move in lower-priced stocks such as these to make outsized returns when trading. One low-priced biotechnology stock that recently ripped to the upside was Prana Biotechnology (PRAN , which I highlighted in June 26's "5 Stocks Under $10 Setting Up to Soar" at around $2.15 a share. I mentioned in that piece that shares of Prana Biotechnology recently formed a double bottom chart pattern at $1.90 to $2 a share right above its 50-day moving average. This stock was just starting to spike higher right above those support levels and it was beginning to move within range of triggering a major breakout trade above some key overhead resistance levels at $2.22 to $2.35 a share. Guess what happened? Shares of Prana Biotechnology started to trigger that breakout a few trading sessions later with decent upside volume flows. Shares of PRAN have continued to trend higher since that article with the stock tagging an intraday high on Wednesday of $2.75 a share. That represents a fat gain of close to 30% in a very short timeframe for anyone who bought PRAN in anticipation of that breakout. I don't think PRAN is anywhere near done going higher, so traders should now watch for $2.75 to its gap-down-day high from April at $3.24 to get taken out with volume for the next major leg higher to begin. One under-$10 technology player that's starting to trend within range of triggering a big breakout trade is Wave Systems (WAVX , which develops, produces and markets products for hardware-based digital security in the U.S. and internationally. This stock is off to a hot start so far in 2014, with shares up sharply by 57%. If you take a glance at the chart for Wave Systems, you'll see that this stock has been basing and consolidating for the last few weeks, with shares moving between $1.35 on the downside and right around $1.50 on the upside. This base is occurring right above its 200-day moving average and just below its 50-day moving average. Shares of WAVX counter-trended higher on Thursday while the market dropped. That move is now starting to push shares of WAVX within range of triggering a big breakout trade above some near-term overhead resistance levels. Traders should now look for long-biased trades in WAVX if it manages to break out above some near-term overhead resistance levels at $1.49 to $1.50 a share with high volume. Look for a sustained move or close above those levels with volume that hits near or above its three-month average action of 1.51 million shares. 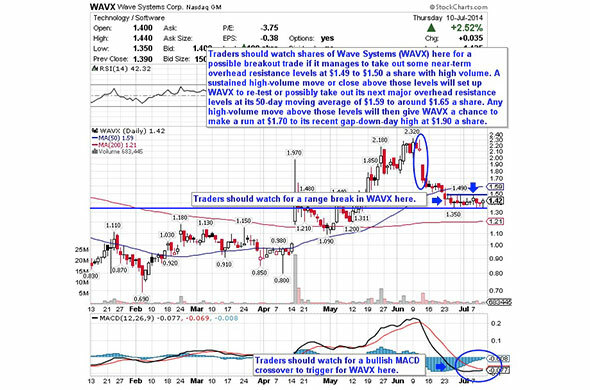 If that breakout gets started soon, then WAVX will set up to re-test or possibly take out its next major overhead resistance levels at its 50-day moving average of $1.59 to around $1.65 a share. Any high-volume move above those levels will then give WAVX a chance to make a run at $1.70 to its recent gap-down-day high of $1.90 a share. Traders can look to buy WAVX off weakness to anticipate that breakout and simply use a stop that sits right around some key near-term support levels at $1.35 to $1.30 a share. One can also buy WAVX off strength once it starts to clear those breakout levels with volume and then simply use a stop that sits a comfortable percentage from your entry point. An under-$10 multi-channel specialty retailer that's starting to move within range of triggering a near-term breakout trade is Wet Seal (WTSL , which operates stores that sell fashionable and contemporary apparel and accessory items for female consumers. This stock has been destroyed by the bears so far in 2014, with shares down sharply by 65%. If you take a look at the chart for Wet Seal, you'll notice that this stock recently formed a double bottom chart pattern at 80 cents per share. That bottomed formed after shares of WTSL downtrended badly from around $2.85 to that 80 cent low over the last six months. Shares of WTSL have now started to rebound off that double bottom support zone and off a near-term uptrend line. That move is starting to push shares of WTSL within range of triggering a near-term breakout trade. Market players should now look for long-biased trades is WTSL if it manages to break out above some near-term overhead resistance levels at Thursday's intraday high of 95 cents per share to around $1 a share with high volume. Look for a sustained move or close above those levels with volume that registers near or above its three-month average action of 1.53 million shares. 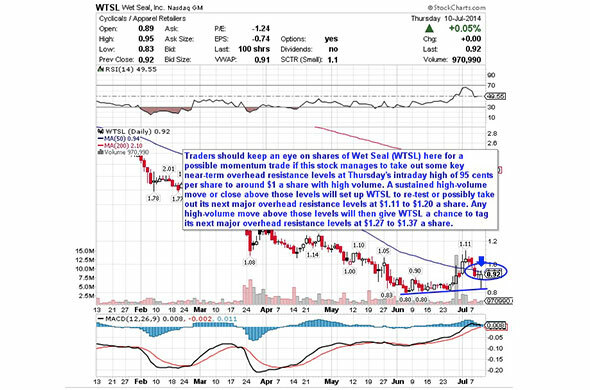 If that breakout kicks off soon, then WTSL will set up to re-test or possibly take out its next major overhead resistance levels at $1.11 to $1.20 a share. Any high-volume move above those levels will then give WTSL a chance to tag its next major overhead resistance levels at $1.27 to $1.37 a share. Traders can look to buy WTSL off weakness to anticipate that breakout and simply use a stop that sits right below Thursday's intraday low of 83 cents per share or around that major support at 80 cents per share. One can also buy WTSL off strength once it starts to take out those breakout levels with volume and then simply use a stop that sits a comfortable percentage from your entry point. Another under-$10 technology player that's starting to move within range of triggering a major breakout trade is NII Holdings (NIHD - Get Report) , which provides wireless communication services under the Nextel brand name to businesses and individuals. This stock has been absolutely destroyed by the bears so far in 2014, with shares off sharply by 77%. If you take a glance at the chart for NII Holdings, you'll notice that this stock recently formed a double bottom chart pattern at around 57 cents to 54 cents per share. That bottomed was tagged after shares of NIHD ripped higher in early June from its 43 cents per share to its high of around 76 cents per share. Shares of NIHD are now starting to flirt with its 50-day moving average of 63 cents per share and it's quickly moving within range of triggering a major breakout trade above a key downtrend line. That downtrend line has acted as tough resistance for the last month, so a move above it with volume could signal a trend change for shares of NIHD. Traders should now look for long-biased trades in NIHD if it manages to break out above that key downtrend line that starts right around 66 cents per share with high volume. Look for a sustained move or close above that level with volume that hits near or above its three-month average action of 4.81 million shares. If that breakout triggers soon, then NIHD will set up to re-test or possibly take out its next major overhead resistance levels at 75 cents to 76 cents per share. 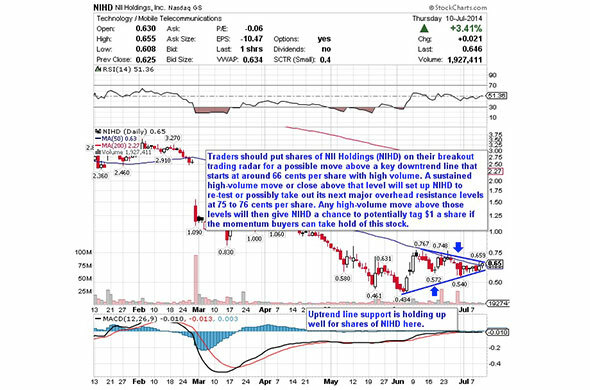 Any high-volume move above those levels will then give NIHD a chance to potentially tag $1 a share if the momentum buyers can take back control of this stock. Traders can look to buy NIHD off weakness to anticipate that breakout and simply use a stop that sits right below some key near-term support levels at 57 cents to 54 cents per share. One can also buy NIHD off strength once it starts to bust above 66 cents per share with volume and then simply use a stop that sits a comfortable percentage from your entry point. Another under-$10 stock that's starting to trend within range of triggering a big breakout trade is Magellan Petroleum (MPET , which explores for, develops, produces and sells crude oil and natural gas in the U.S., Australia, and the U.K. This stock has been on fire so far in 2014, with shares up sharply by 108%. If you look at the chart for Magellan Petroleum, you'll see that this stock recently formed a major bottoming chart pattern over the last month at $1.93, $1.92 and $1.96 a share. Shares of MPET are now starting to spike higher just above those support levels and it's quickly moving within range of triggering a big breakout trade above some key near-term overhead resistance levels. It's also worth noting that shares of MPET counter-trended higher on Thursday as the market dropped, which could be signaling that there are few large sellers in the stock here. Market players should now look for long-biased trades in MPET if it manages to break out Thursday's intraday high of $2.20 a share to some more near-term overhead resistance at $2.26 a share with high volume. Look for a sustained move or close above those levels with volume that hits near or above its three-month average volume of 496,315 shares. If that breakout hits soon, then MPET will set up to re-test or possibly take out its next major overhead resistance level at its 52-week high of $2.52 a share. Any high-volume move above that level will then give MPET a chance to tag $3 to $3.50 a share. 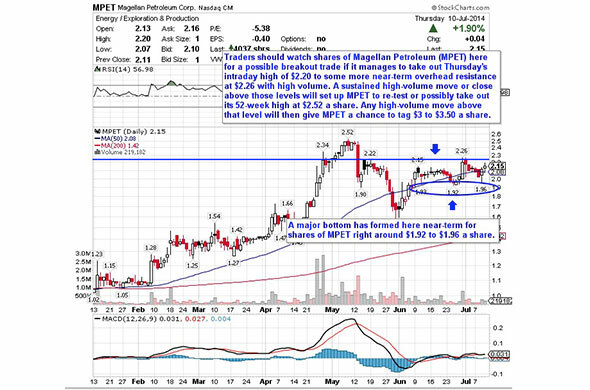 Traders can look to buy MPET off weakness to anticipate that breakout and simply use a stop that sits right below that triple bottom support zone around $1.96 to $1.92 a share. One can also buy MPET off strength once it starts to move above those breakout levels with volume and then simply use a stop that sits a comfortable percentage from your entry point. One final under-$10 biopharmaceuticals player that looks ready to trigger a big breakout trade is Biota Pharmaceuticals (BOTA , which focuses on the discovery and development of anti-infective products in Australia. This stock has been rocked hard by the sellers over the last three months, with shares off sharply by 48%. 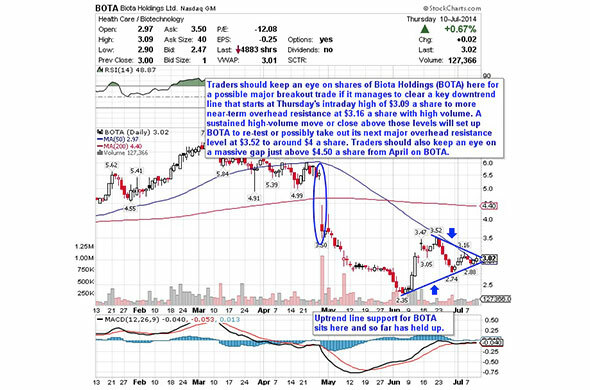 If you take a glance at the chart for Biota Pharmaceuticals, you'll notice that this stock has been making higher lows over the last month or so after a number of sharp moves higher. That pattern has formed a strong uptrend line support zone for shares of BOTA that so far has held up. Shares of BOTA are now starting to take out its 50-day moving average of $2.97 a share. This stock moved above that key technical level on Thursday as it counter-trended against the overall market weakness. Shares of BOTA are now quickly moving within range of triggering a big breakout trade above some key near-term overhead resistance levels. Traders should now look for long-biased trades in BOTA if it manages to clear a key downtrend line that starts at Thursday's intraday high of $3.09 a share to some more near-term overhead resistance at $3.16 a share with high volume. Look for a sustained move or close above those levels with volume that registers near or above its three-month average action of 168,789 shares. If that breakout materializes soon, then BOTA will set up re-test or possibly take out its next major overhead resistance levels at $3.52 to around $4 a share. Traders can look to buy BOTA off weakness to anticipate that breakout and simply use a stop that sits just below some key near-term support levels at $2.88 to $2.74 a share. One can also buy BOTA off strength once it starts to take out those breakout levels with volume and then simply use a stop that sits a comfortable percentage from your entry point.